Confession: I really struggle to spend money on high end beauty buys. I think it's probably clear by now that I'd rather spend my money on Starbucks or ten thousand cans of dry shampoo. But, this mug isn't getting any younger and I need more products than ever to keep the under eye bags and unfortunate wrinkles + acne combo in check. When I find a great product, I'm happy to splurge on it and when I find a great drug store dupe I'm thrilled to brag about it. My friend Ashley had this little Revlon blush and bronzing palette (officially called the Revlon Highlighting Palette) when we were in Arizona and I basically stole it from her during our trip. I actually used it as an eye shadow palette and it's a great dupe to the key colors in the Naked3 Palette, but at a drugstore price. Bonus: it's perfect for traveling because you can use it as eye shadow, highlighter, bronzer and/or blush. Oh man does this fragrance smell Heavenly. 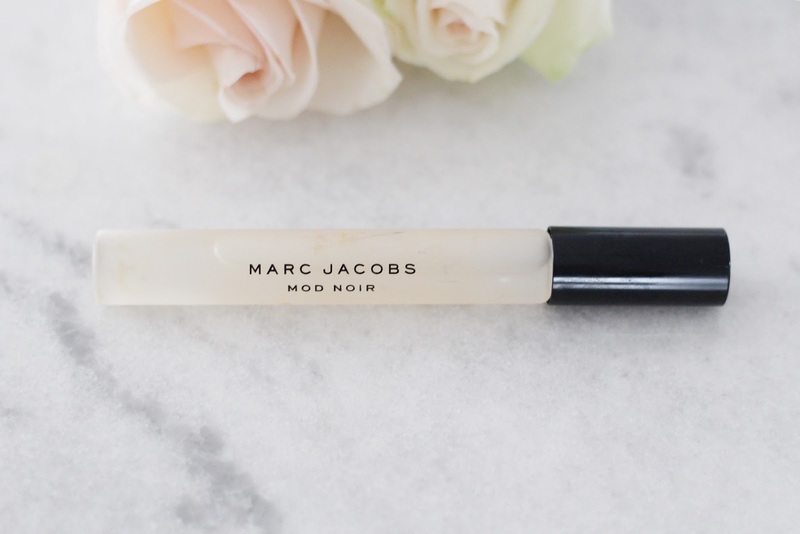 Mod Noir by Marc Jacobs is light, floral, feminine, I'm obsessed. I love snagging the roller ball size in fragrances because I don't have to shell out as much cash and I can stash it in my make up bag or a cosmetic pouch in my purse. Verdict: smells perfect, roller ball size makes the cost more reasonable, glad I grabbed it. I had grand plans when I purchased this L'Oreal Brow Stylist Sculptor but when I got home I was too bored with it to even bother really trying it out. One end is to fill in the brows, the other is to......snooze. I have dark, full brows and don't really need to do much in the way of filling them in so this pencil was just not in my wheel house. Now this is the kind of brow product I can get behind! The Maybelline Brow Drama is a simple brow mascara that is so easy to use, fills in your brows and shapes them a bit and doesn't smudge on your face. For someone who doesn't focus on her brows that much, this is a perfect addition to your routine. I feel like I was the last person on Earth to get on board with Make Up For Ever HD Microfinish Powder. Honestly, I just thought it seemed like a high price point for a setting powder but when I spotted a smaller size in that damn impulse section around the check out area of Sephora, I thought it was worth a try. And, of course, I love it. It leaves my skin looking gorgeous and my foundation smooth. I also love the way the product is packaged to prevent spilling and waste of the pricey powder. Verdict: Pricey but worth it. I'll be buying again, most likely in the full size. I snagged the Maybelline Falsies Push Up mascara from Target on a whim and it was a waste of money. I know it's a drugstore buy but the quality of the mascara is basic at best. My eyelashes do not look thicker or longer - so, fail. Verdict: Nope, doesn't rock my boat. I love Kat Von D products. I wear her Lock It Tattoo Foundation every day (and rocked it hard on my wedding day) and think it's the best full coverage out there. Not surprisingly, the Lock It Concealer is also a win, covering blemishes with deep pigment. I'm honestly disappointed that I didn't purchase it until recently. Seriously, everything she makes is worth every penny. So, now that I've professed my love for Kat Von D products, I do have to say that, sadly, I am apparently allergic to her insta-famous Shade and Light Palette. I wanted to love it so badly but my skin broke out, my throat closed up and sadly my cheekbones are left less than sculpted. So, help a girl out, any recs for an amazing contour palette? Don't forget to enter the Elle + J giveaway in yesterday's post! Just a few more hours until the winner is chosen! Oh no I wonder what made you have an allergic reaction. Do you know if it was a specific ingredient in the product? I have been looking for a good highlighter so I may check out the Revlon line. Thanks! Great list, I'll have to check some of this stuff out! Although I have to agree on that Maybelline Push Up Mascara, I wasn't a fan either :( I am a sucker for new mascaras but that one didn't wow me at all. I like the Urban Decay Naked Flushed palette for a natural contour look. I don't have the time or the skill for full on contouring every day. This makes it simple to sweep on some bronzer, highlighter, and blush and not look a Kardashian-wannabe in clown makeup. I'm totally on the same page with dropping money on coffee (and really food) over beauty products. I do want to try that brow mascara though. I've been loving brow fillers lately. The Elf brow kit is a really good deal for only $3 if you're looking for other brow options. I am in the same spot right now...never really spend money on beauty products, but my face is starting to tell me a different story...I just started this venture... lots of sample kits ordered and youtube tutorial videos before I spend the big bucks if they aren't necessary...so I appreciate the tips! Why does something that comes in the smallest tubes cost so much?! I've been so tempted to try a setting powder versus powder I use now. I may have to give this a try since the Laura Mercier setting powder is just a little too expensive for a test run! Thanks for the review. I know you said you're not much of a brow girl, but Kat Von D Tattoo Brow has become my saving grace. Amazing. Also have to hype Maskcara HAC pack - great contour kit. I switched to the IT cosmetics HD powder from the MUF one a while back and am so much happier with it. It looks less white and chalky so less blending and you don't have to worry about looking like a ghost in photos. They just made a pressed version I'm anxious to try when I run out.